KoopaTV: Bowser Jr.'s Journey... to ARMS Scrub? By LUDWIG VON KOOPA - He's on a journey, but it's not to anywhere good. As Alex Hunter's Journey ends after FIFA 19 releases next week, Bowser Jr.'s Journey is apparently just beginning when Mario & Luigi: Bowser's Inside Story + Bowser Jr.'s Journey releases next year. Bowser Jr. is dragging Morton Koopa Jr., Roy Koopa... and KAMEK with him? Well, at least it's not me on there. 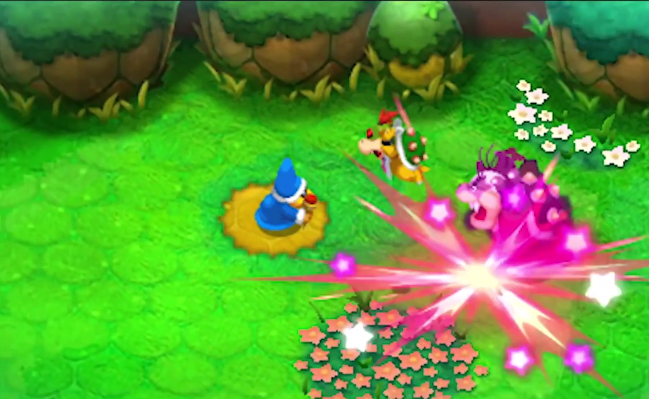 Kamek isn't going to actually help Bowser Jr. as Morton mauls him, by the way. Though I can't tell you what the purpose is of Bowser Jr's journey (he's not the kind to think things through, you know), I can tell you why Bowser Jr. is on a journey. 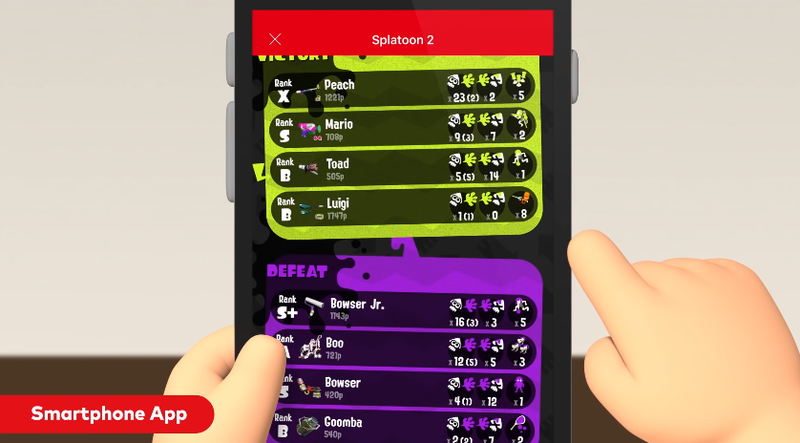 After the second nerf he got in Mario Tennis Aces on July 31st, Bowser Jr. was no longer on the very top tier in Mario Tennis Aces like he used to be. Bowser Jr., unable to compete with Bowser and Koopa Troopa (and soon Paratroopa) for the top-of-the-tier tennis crown, went to look for other online multiplayer games to dominate. 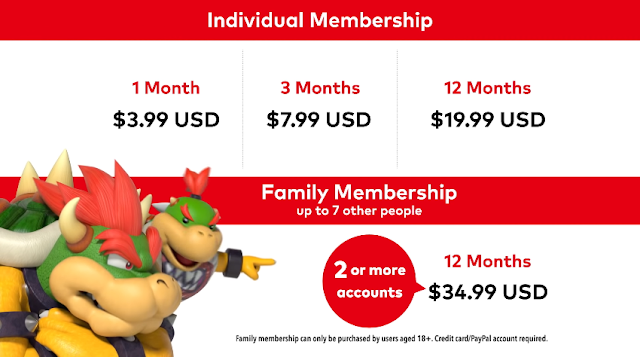 Since King Bowser's parental controls prohibit Bowser Jr. from playing T-rated online games like Fortnite that don't require a Nintendo Switch Online subscription (though that doesn't stop other people's babies from playing Fortnite), Bowser Jr. had to trick King Dad into buying a family membership as part of a family group to be able to play Nintendo's online games that are more age-appropriate for Bowser Jr.
Did you know that you can trick us into inviting you to KoopaTV's Nintendo Switch Online family group by joining KoopaTV's staff? Also, for the KoopaTV Loyalty Rewards Program round 22 (September to end of October), you can win your way into the family group as well! If I was Bowser Jr.'s parent (a scary prospect), I'd just tell him to play online games on the Wii U. Fortunately for myself, I'm not anyone's parent, so Bowser Jr. is trying to play games like... ARMS. Yes, ARMS. 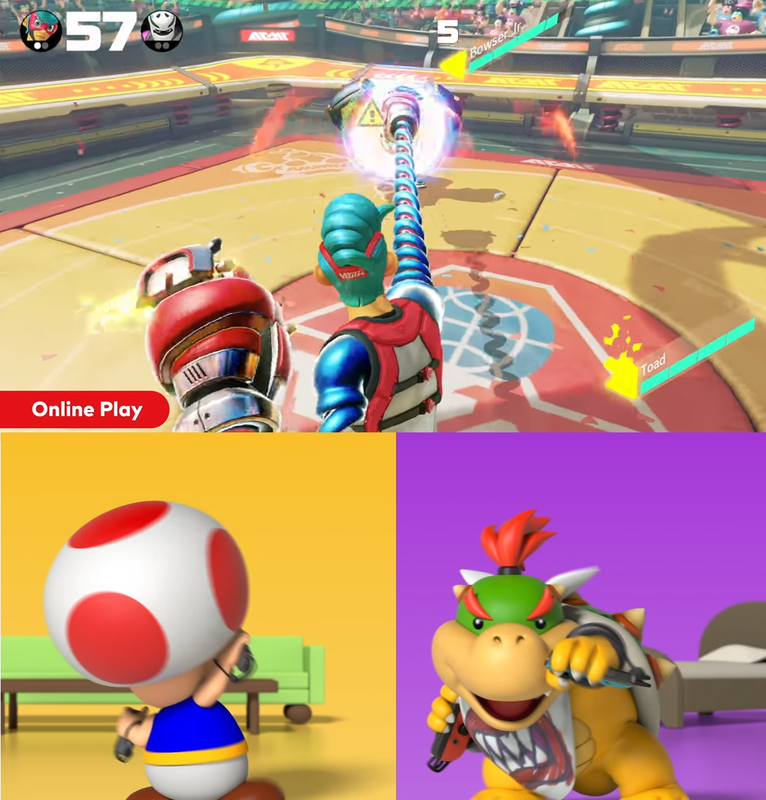 Bowser bought ARMS for his kids. I'll leave it up to you to determine what he thinks of his children. TOAD HAS HIS BACK TO THE SCREEN AND HE'S STILL ONE FULL GAME AHEAD OF BOWSER JR.
And Toad's ahead in the current game as well! Bowser Jr. hasn't even landed a punch. So... yeah, Bowser Jr. is wasting Koopa Kingdom money on being an online scrub by getting King Bowser to pay even more money to access an exploitative online subscription service. Bowser Jr. should at least avoid being a scrub by playing the single-player modes offered in these games. 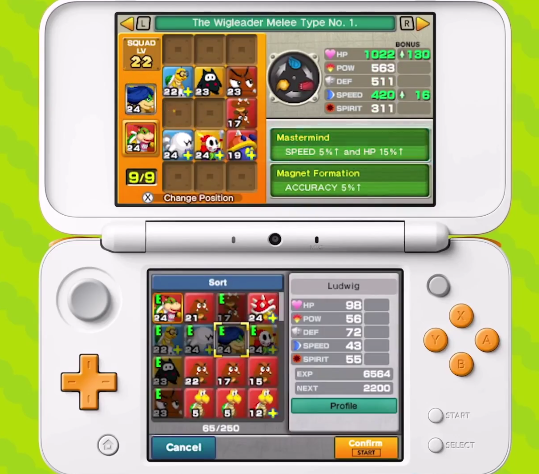 Perhaps Bowser Jr. should consider learning some (non-ARMS) skills from the Mastermind Wigleader... yours truly! You're still bound to lose, since you're a dweeb, but at least you'll look respectable doing it. I do play with the Hero Splat Roller a lot, you know... I'll even be playing with it this weekend, too for the Team Retro vs. Team Modern Splatfest starting right about now! Ludwig really just wanted to make fun of Bowser Jr. so he wrote this article. He feels a lot better about himself after bullying the toddler. 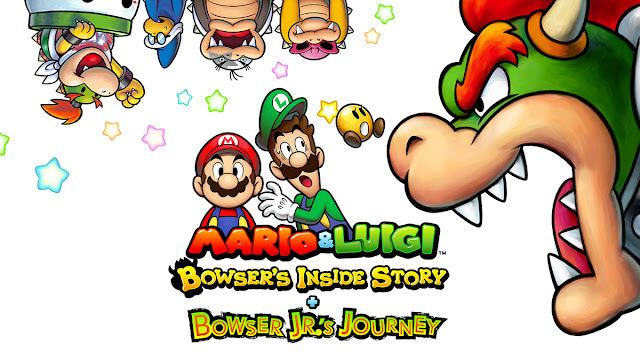 Mario & Luigi: Bowser's Inside Story + Bowser Jr.'s Journey has released now. Is there going to be an article on Bowsette? There's nothing much to say, and it doesn't actually exist and I don't want to give it attention. Here's a whole article about why there won't be an article on... it. Wow I understand now! It's refreshing to come here and see something from a unique perspective rather than the regurgitated trash that other sites spit out. Thanks for taking the time to answer my question so thoroughly.